Contributing to Smoother Testing Operations by Enhancing After Sales Support ARKRAY Commences Overseas Remote Maintenance Services for Medical Devices | ARKRAY, Inc.
From January 11, 2019, ARKRAY, Inc. will commence its overseas remote monitoring system service for medical devices. 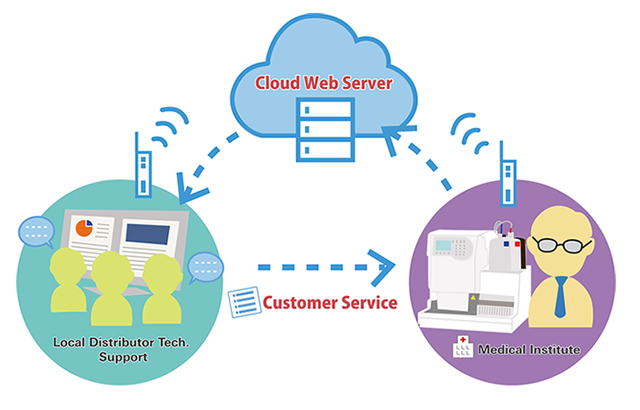 The monitoring and diagnosing of the operation state of medical devices being used at medical organizations will allow for prompt investigation and repair of device malfunctions, thereby contributing to shorter downtimes. ARKRAY, Inc. (hereafter, ARKRAY) will commence remote monitoring system service for its overseas medical device (Name: Intelligence by Connected ARKRAY Products) Medical organizations making use of ARKRAY's devices will be connected to ARKRAY's technical support team*1 via a network, allowing for two-way remote service. Presently, in Japan, optimal operation conditions are maintained by routine maintenance and repairs conducted by service engineers. Furthermore, a remote monitoring service was launched in 2012 and has been adopted by many medical organizations. Conversely, in overseas areas, a small number of technical support staff have had to cover large regions, leading to difficulties in providing support with the same promptness and accuracy as that provided in Japan. By commencing overseas operation of the same remote monitoring service operating in Japan, ARKRAY will seek to enhance its after-sales support system. Using this service, overseas technical support teams will monitor the status of devices and perform prompt repairs in the event that an abnormality or malfunction is detected. Doing so will lead to shortened device downtimes and improved customer satisfaction levels. This service will first commence for now-available HbA1c (hemoglobin A1c)*2 testing devices*3 and will then be expanded to cover urine test instruments*4. ARKRAY products are now being used in over 80 countries and regions. ARKRAY has also continued to focus on service activities that answer local needs, such as the establishment of a repair center at its Pinghu Factory in China. Continuing into the future, ARKRAY will strive to enhance its service activities both domestically and overseas and contribute to the medical field. The operational state of instruments is viewed by accessing the "Intelligence by Connected ARKRAY Products" web server. As long as an Internet connection is available, devices' operation state can be checked anywhere, anytime. If a malfunction prediction is detected, trouble occurs with the device, or if connection with the device is lost, and alert is sent, and staff are notified via email. *2 HbA1c is formed when hemoglobin within red blood cells combines with glucose and is a marker to identify the average blood glucose concentration in the last one to two months. This service will be provided by "ARKRAY Infinity, Inc.". ARKRAY Infinity, Inc. is a contractor for ARKRAY, and provides services and maintenance for ARKRAY as well as other companies.